The issues facing children today include increasingly earlier occurrences of almost epidemic obesity rates and sedentary lifestyles, which are putting greater importance on the development of sound physical play experiences. 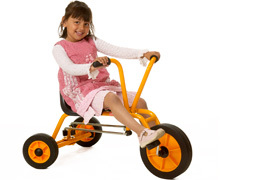 At RABO Tricycles we recognize today's children's increased need for mobility and exercise and will continue to lead the way of providing healthy, innovative wheel-based play solutions to facilitate physical activity at play. The future of play depends on providing children with experiences that will allow them to grow and develop while physically challenging them to explore the world around them. As a result RABO works with independent specialists in designing products that target obesity among children through fun at play.